The first step was to understand the needs and feelings of the interrogator. Dania and her inquisitor were like two people standing on opposite banks of a river, separated by murky waters that neither of them could understand. As he was the one in the position of power, she was the one who had to try to reach the other bank. [This article is the outcome of a partnership between SyriaUntold and the Syrian Female Journalists Network (SFJN) and part of the latter’s project Female Storytellers: Out of the Shadow]. ‘Do you think it will spread to here? No, it couldn’t, people wouldn’t dare.’ The winds of change arrived in 2011. Syrians went out into the streets to give freedom to their voices for the first time. She was among them: Dania, the young women from Damascus, the mother of a boy who was still in the first days of his youth. Dania, who had a PhD in Middle East history. After the revolution came to Damascus, however, her interests shifted. She took part in peaceful demonstrations and sit-ins until she was detained for the first time after the al-Wahda Sports Club demonstration in October 2011. She was accused of smuggling protesters into the area, having been identified from her car’s number plate. After she was released, Dania moved into aid work and started coordinating peaceful activities. She was arrested for the second time in 2012. After being released again, she shifted her activism work to the Ghouta area of Damascus, concentrating on women and children’s issues, while continuing a small amount of aid work. During Ramadan in 2013, she was detained for the third time at the al-Malihah checkpoint. Dania spent many days in solitary confinement, and was the victim of various forms of torture. At the time she did not appreciate her own abilities, until one day she decided ‘to listen to her heart.’ In her new approach there was no room for generalizations, judgments, comparisons, and unsolicited advices: only compassionate listening. This was the idea, which freed her from the confines of her memories, and it was her most important mechanism of nonviolent communication. Before her third arrest, she had undergone training on different aspects of civil society. This had included a course on nonviolent communication. People often do not really believe that this can bring about change. Nevertheless, when Dania was facing a situation as bad as that inside the prison, she had nothing to lose, and had no alternative but to give it a try. The first step was to understand the needs and feelings of the interrogator. Dania and her inquisitor were like two people standing on opposite banks of a river, separated by murky waters that neither of them could understand. As he was the one in the position of power, she was the one who had to try to reach the other bank. Dania made her first attempts during these interrogation sessions, but a long time passed before any change was evident. The interrogator finally started listening to her when she told him that she knew how difficult it must be for him to be away from his children and family for months at a time, and that she understood how much he and his family needed each other. She told him that she would give toys to any child irrespective of their family’s political affiliation or views, as they all had the same right to enjoy and celebrate the Eid like any other child. This was her approach to the children of Ghouta. At the Palestine Branch in 2012, when reaching out to her interrogator’s humanity, he told her about his unfulfilled dream of studying geography. He ended up telling her a lot of his life story, despite the fact that she was his enemy – at least in theory. At the Political Branch, after an interrogator scolded her, she then got a positive response from him. ‘Have we asked you for a bribe at all?’ he asked. ‘That’s what people are writing about us.’ She agreed that this had never happened. She also called her family to warn them of the importance of not spreading falsehoods. This pleased the interrogator and made him feel that he was being treated justly. Before this, Dania had believed her questioners to be surly and cruel men whose only concern was to extract confessions, regardless of whether they were true or false. This incident allowed her to change the way she saw these interrogators. Yes, they were adversaries, but you could listen to them and hold a discussion with them. ‘There is no point in saying to people in pain that you are also in pain. That won’t make them feel any better. It’s better to say that you feel their pain, or that their pain must be great.’ With these words, Dania started to talk about the mechanisms of nonviolent communication. As she says herself, they sound deceptively simple, but in practice they are extremely difficult. When you wish to apply them, it is important to concentrate on the emotional needs of the other person. You shouldn’t try to communicate according to their rational intellect; you should speak heart to heart. Rationality destroys human stories. You shouldn’t make comparisons, or give advice; you should just listen compassionately. In nonviolent communication, nobody is right or wrong. Nobody can put themselves in another’s shoes. By adopting these principles, Dania managed to understand that some of the guards who took food away from prisoners were themselves in need of something. The guards did not harbor any real resentment towards the prisoners. Dania realized that they were just hungry Syrians too, and were not getting enough food either. One day, the prison warden flew into a rage when he found out that one of the female detainees had drawn the flag of the revolution on the wall with chalk. Dania managed to use her skills again when the other detainees accepted her as their de facto spokesperson. She calmed the prison warden by discussing what had happened and attempting to make light of the situation. She told him that the flag wasn’t from the French Mandate period, but that according to what she had learnt during her studies, she believed that it had first been raised when the country became independent. Things began to change after these attempts at dialogue. The forms of torture being used against the detainees were eased and ultimately stopped completely. The detainees also received half an hour of recreation time, more food, and some sweet halva to combat low blood sugar levels. 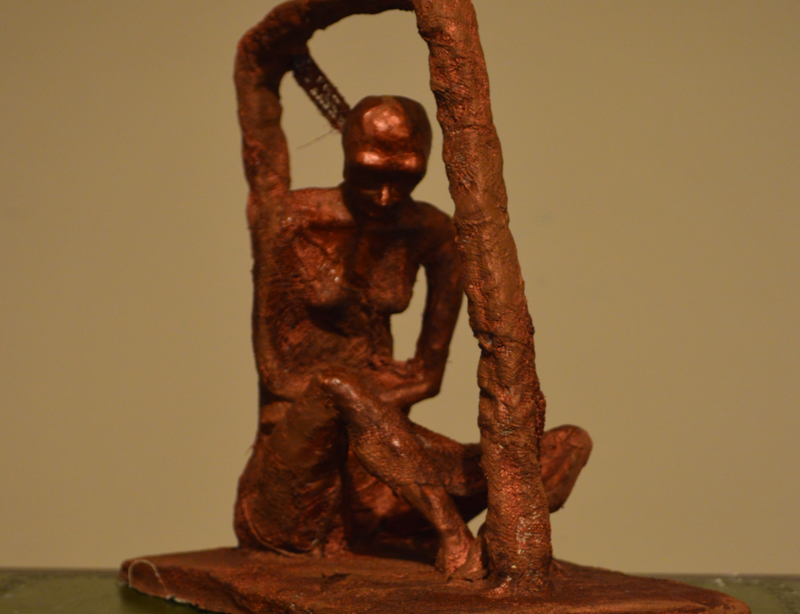 [Image: Dania portrayed in a sculpture that was realized by Syrian artist Oula Ash-Shaykh Haidar for the purpose of this story]. Dania spent several months away from her son and family after travelling to Lebanon, from where she was finally unable to return. She found a new space for herself to work, entering the refugee camps as an activist. She obtained funding from her professor Dr. Wajd Sibai to hold nonviolent communication courses in Reyhanli in Turkey, and in Arsal and the Middle Bekaa in Lebanon. Once she had been a trainee, but now she was a trainer. Following circumstances in Egypt which made it impossible to continue the project there, Dania tried to replicate her experience with the ‘My Right’ project in Arsal, founding a women and children’s organization with the alternative name, ‘My Library’. Earlier attempts in the Ghouta region of Damascus were hampered by economic hardship and the fact that the area had come under the control of militias. She finally managed to train two teams in Arsal, the first from Yabroud, and a second from al-Qusayr. To begin with, there was a big rift between these two teams, as the people of Qusayr consider people from Yabroud’s Qalamun Mountain region to be inhospitable. However, as the course drew to a close, both groups merged into a single team, helping each other to set up and equip a shared centre, which they named ‘My Library’ after Dania’s previous project. Dania worked to provide support to children and mothers in the Bekaa Valley, where the Sonbola educational initiative was set up. She founded and ran schools in the Middle Bekaa, all the while continuing her work with women and children’s rights organizations. She assisted them in reaching as large a section of the refugee population as possible. In the camps, you could always find her surrounded by children with a smile on her face. Nonviolent communication was more than just words for Dania: it was her way of life. I observed her during one of the workshops that had brought us together in Lebanon. She was trying to find common ground between groups of Syrians who couldn’t see eye to eye, focusing on trying to understand the feelings of the other party. When I heard her drawing her friend’s attention to the violent ideas that had surfaced while he spoke, I realized that she was one of the peaceful female fighters that the Syria of the future would need. Unfortunately, however, life has taken her elsewhere. Fleeting breezes from Damascus summoned Dania and her son to the border and the Bekaa valley, where she spent the rest of her days in Lebanon waiting to return to what lay behind the mountains. Today, her physical body is with her son in Germany, where she is making a new start, but her soul resides in Damascus, the home of all her memories. [Main photo: A revolutionary graffiti in Saraqeb, Idlib. It reads "Revolution is love for everyone" - 29-7-2012 (Saraqeb Walls Facebook page/Fair use. All rights reserved to the author)].